From the studios of John Ryan came this amusing 5 minute animation which was first broadcast on BBC1 on 13th January 1972. There were 31 episodes in total, and if you think that the characters look very similar to those in that featured in Captain Pugwash, then you're not wrong - both animations were written and produced by John Ryan. I'm really having to strain my brain to fire-up memories of this show, although I certainly do have some and remember watching the repeat runs during the 1970s. 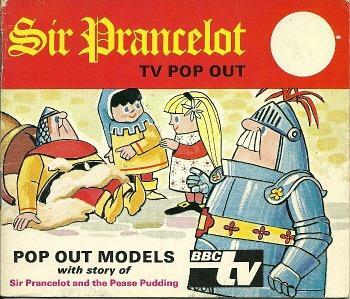 Sir Prancelot is an eccentric inventor-knight who decided to escape from his domineering bank manager and wife (Lady Histeria) to embark on a crusade to the Holy Land. However, much to his dismay, Histeria decided to join him, along with the rest of his household! The main enemies were Count Otto and Duke Uglio who could be outwitted by Prancelot's wacky inventions. Sim and Sue were Lancelot and Histeria's two children. Master Girth was the chief steward (Majordomo) of the castle who manages the accounts. 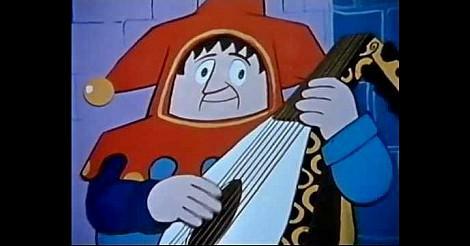 The Minstrel was a cockney lute player who is also used as the narrator of the series. Bert and Larry were serfs (lower class peasants). There were other serfs but they were never named. Pig William "Pigwig" was Lady Histeria's pet pig. Duke Uglio was a selfish, Italian aristocrat and enemy. Count Otto was the main enemy and adversary of Sir Prancelot. All voices were provided by Peter Hawkins (who sadly died on 8th July 2006 aged 82) who also voiced Captian Pugwash. He also provided the original voice for Zippy in Rainbow when he first appeared in 1972. The almost psychedelic style theme music was composed by Alan Parker. He is still very much alive and recently provided music for the BBC series Coast, as well as ITV's News at Ten.